Today was a big day… my sweet little Iyla Grace had her first official day of school! She is attending a small Monday/Wednesday morning program (she is one of only 8 kids!) 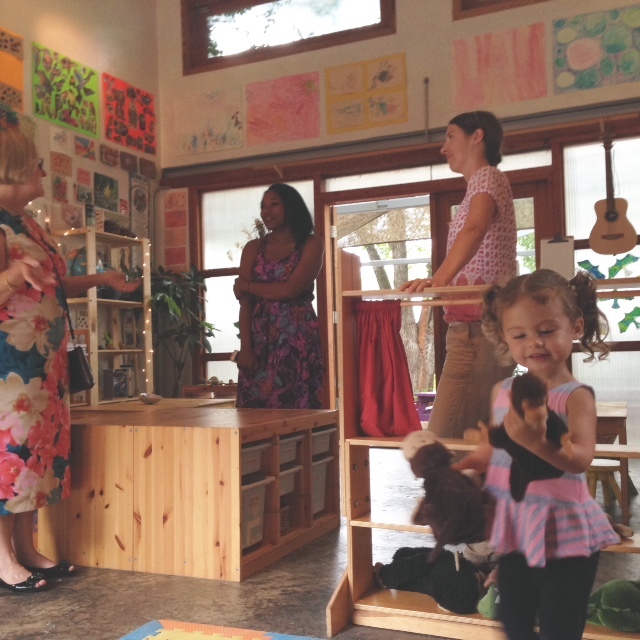 at a darling Montessori based school, run by a husband/wife team and assistant teacher. The school house and gardens are absolutely beautiful and magical, and I knew within seconds of my first visit that this would be a place Iyla would adore. Last Friday they had an open house for the new students & parents, and Iyla had so much fun playing! I mean, this place has a mini fairy house in it. If that isn't perfect for Iyla, I don't know what is. There was also a tent filled with stuffed animals, including the entire Winnie the Pooh gang and Curious George- some of Iyla's favorites! 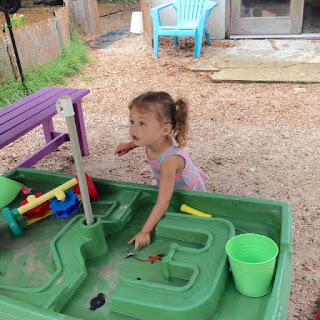 A water table for my water baby! Come this morning, Iyla was totally ready to go! I told her we'd be putting on her backpack and taking photos, which was a sneaky Mama trick… I made it sound like photos were a first day of school rule/routine (which they WILL be!) and my sweet girl- who typically fusses when I pull out the camera- happily posed for me! Success. This was the first face I got when I asked her to smile. A work in progress. The teachers had set the expectation that often on the 1st day it's good for new kids to be picked up after an hour, depending on how they are doing. I made sure to have several errands to run within 15 minutes of her school, but was happy to receive two text updates both saying that she was doing great and should be able to stay the full morning. When I went to pick her up, Iyla was beaming, shouting "Mama! Mama! You're here!" Her teachers reported that she was the only new kid to last the entire morning. They also said that she had eaten a great lunch and led all the other kids in a new way to eat it. They had been served pesto pasta and soup (fresh from the gardens there!) and Iyla had started dipping her pasta in the soup and drinking it that way- to which all the others kids apparently followed suit. That's my girl! Other updates included Iyla having made up some new moves during yoga time, and sweetly asking permission to play with the water table (she told me that was one of her favorite things!) The teachers said she did a great job participating all morning long.